Christine Blasey Ford, the California psychologist who told a Senate committee Thursday that Supreme Court nominee Brett Kavanaugh sexually assaulted her decades ago when they were both teenagers, appeared credible as she recounted her harrowing ordeal, legal specialists said. Gertner cited several factors that she said bolstered Ford’s credibility, including her consistency about the gaps in her memory of the alleged assault dating back to the 1980s. 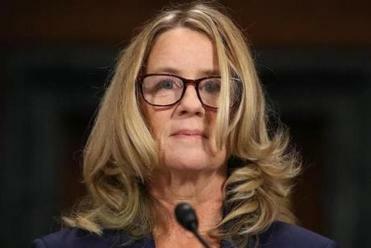 Ford said that she’d “agonized daily” over coming forward about the alleged decades-old attack. Gertner said Kavanaugh’s reputation has been “irretrievably tainted” and that if he cared about the Supreme Court as an institution, he would withdraw his nomination. His appointment could undermine the court, she said. “He doesn’t seem to care,” she said. Rosanna Cavallaro, a Suffolk Law professor and former state assistant attorney general, said she found Ford “exceptionally credible” during her testimony. Kavanaugh’s testimony, on the other hand, made it appear as if he had been instructed to change his tone from “humble and lovable to outraged and victimized,” said Cavallaro. “If they wanted real fact finding, they would have re-opened the FBI investigation,” she said. Others also criticized the structure of Thursday’s hearings. William D. Kickham, a defense attorney who has offices in Boston and Westwood, criticized the format of the hearing. Mitchell questioned both Ford and Kavanaugh. Kickham thought Senate Republicans “buckled under the weight of political correctness” by having Mitchell handle their questions. “Half the committee should not have been gagged,” he said. Democrats, he said, were able to question Kavanaugh as they wished.“How could anyone perceive that to be fair and equitable?” he asked. Janice Bassil, a veteran Boston defense attorney whose clients have included Aaron Hernandez’s fiancée and defendants in high-profile sexual assault cases, also concluded Ford was credible. Bassil said the purpose of some questions posed by special counsel Rachel Mitchell were not clear to her. Bassil, recalling Anita Hill’s testimony during the Clarence Thomas hearings, said she expects the Senate will ultimately confirm Kavanaugh to the lifetime appointment, Ford’s credible account notwithstanding. Bassil thought Kavanaugh came off as entitled. “I think his premises is he’s entitled to it and he’s being taken from him,” she said of the Supreme Court seat. “Look, if I were representing him in a criminal case and the standard was beyond a reasonable doubt, I’m sure I would have been pleased with this, but this isn’t a criminal trial,” she said. “Anger doesn’t really get your point across,” she said. Kavanaugh’s suggestion that part of the reason behind the sexual misconduct allegations is a revenge plot “on behalf of the Clintons” is ridiculous, said Bassil. In the 1990s, Kavanaugh was on the team that investigated President Bill Clinton as part of special prosecutor Kenneth Starr’s investigation. The report led to Clinton’s impeachment, though he was not removed from office. Cavallaro, also addressing the issue of confirmation, said there are important distinctions between a Supreme Court confirmation hearing and a criminal trial. Mark J. Geragos, a prominent criminal defense lawyer in Los Angeles whose client roster has included Michael Jackson and Chris Brown, also said he found Ford believable. “She does seem credible and this format is welcoming to her testimony,” Geragos wrote in an e-mail. Asked what stood out about Ford’s testimony, Geragos cited the “level of detail and the trauma” she displayed. Kavanaugh, he said, was at times forceful and at times unhinged. “There’s a fine line between being aggrieved and emotional and belligerent and unfortunately he crossed into belligerence,” he said. A Kavanaugh rant about his drinking habits as a teen was “unbelievable,” said Geragos. “It’s hard to think this is where we’ve devolved to with the Supreme Court,” he said. Material from the Associated Press was used in this report. Travis Andersen can be reached at travis.andersen@globe.com. Follow him on Twitter @TAGlobe. John R. Ellement can be reached at john.ellement@globe.com. Follow him on Twitter @jrebosglobe.